low energy 12v or 24V DC lighting, a step by step guide to installing off grid lighting and getting it right. Off grid lighting can be many things for many people and can cover many and varied projects from Super high importance to simple fun projects. Examples can be; high power security flood lighting and associated montoring equipment or maybe just a simple garden light to add a cheerful glow to your special shrubs, plants or trees of an evening. 1) Calculating your PV (photovoltaic) panel power requirement (watts).Before we start, some general notes: No matter what your ‘off grid’ project, it is vital to be able to site your solar PV panels so they can harvest the maximum amount of energy (sun light) possible. One of the easiest things to overlook in this respect is potential shading. This can be caused by summer shrub and tree growth. Overhanging foliage will cause severe restriction of output due to partial shading of the PV panel’s cells. A PV panel only needs to be slightly shaded to reduce output dramatically. In the UK, the optimum mounting angle is around 30 to 45 degrees from horizontal and of course, as directly south facing as possible. Another thing to consider is cleaning. Solar PV panels may need cleaning quite regularly if the angle of inclination is quite shallow (perhaps less than 25 degrees). Low angles mounting may allow a film or layer of dirt to build up on the surface – this is because the natural cleaning effect of rainfall is reduced at a lower angle. Most manufacturers of solar panels will recommend a roof inclination of between 22 and 75 degrees from the horizontal. Panels mounted flat or at a shallow angle will get dirty and may even end up with a messy covering of mosses, lichens and grime after some years. This in itself can be a serious problem if access for cleaning is poor or the roofing is fragile, etc. It is worth noting that when mounted at a reasonable angle of say over 30 degrees, most PV panels seem to enjoy a virtual self-cleaning affect. So, how many and what size of PV panels are required? It is best to base the PV systems available power on the available energy production one would expect during winter. The exception to this will be if the project is only required during the summer months. With this in mind, and as a guide, we will allow just 1 hour of power production per day during the winter months. Although, we can maybe expect 4 to 5 hours a day in a reasonable Summer period. So, if we have 300w of solar PV panels (properly sited), we could say it will produce just 300 watt hours per day in winter (but even this will be subject to around 20% losses). 2) Now, about this off grid lighting project. How much light is required? This relates to your low voltage lighting installation; how many lamps will you need, where you site them (for best effect), and how brightly illuminated you need the particular areas to be. Okay, as an example, let’s consider a moderately sized remote stable block with 4 separate areas which we want to illuminate. Maybe there is as a dedicated working area which can of course be fitted with an independent light circuit complete with switch with say two of the new breed OnSolar 3w led. You may consider the total power used in the ‘working area’ to be less than 1 hour a day so in this case just 6 watts. 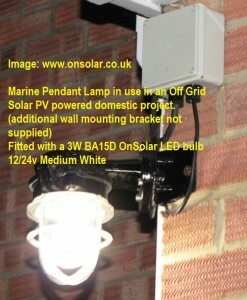 Let’s look further; maybe you need a powerful outside light that can be triggered upon your approach by a PIR detector. If this was say a 10w LED floodlight, we could consider it being illuminated for less an hour total, maybe 30 minutes so in this case 5 watts. Now we come to the main building which may be split so that the stalls have separate illumination but the main area is served by hanging lighting units from the roof void. Let’s look at the main area firstly: Let’s say we fitted two large ‘multi lamp’ fittings with a total power use of 30W and say 4 stalls with an 11W lamp over each. How long would these be ‘on’ during a typical winter late afternoon / early evening? We would guess probably no more than 3 hours on average (as an example). Now we are building a reasonable idea of how much power is require / used during a typical day / evening use at the site. 2 X 3W (working area) for 1 hour = 6w hours, 1 x 10W (outside PIR flood) for 1/2 hour = 5w hours, 10 X 3W (main building void) 30W total X 3 hours = 90W hours, and finally 4 X 11W – this could be a combination of two on and two off (or all lamps on, etc. depending on your actual requirement). But we will allow for 2 lamp fittings being on for (again) 3 hours for our purposes here so 2 X 11W X 3 hours = 66W hours. The grand total of all our lamps added together for power consumption is 172 watt-hours. From this we can deduce that we would be fairly safe and could expect our modest array or perhaps 3 X 100w (300w) PV panels to cope with demand. Now we have a reasonably useful system that can cope with some ‘extras’. What extras? Well, one could keep a mobile phone handy and ‘on charge’ via your solar 12v battery and one may also wish to operate perhaps a nice quality 12v DAB radio for some extra company. So the end result with extras may be in order of 200 watt hours used on a typical day at the site. You may wish to use a lap top on site to record daily information relating to the site’s activities, consumables used or maybe just to write briefly about your horses training or progress. Of course, one can obtain a 12v adaptor to enable a laptop to be used via the sites 12v supply. For an average 1 hour usage, this may add perhaps a further 50W hours to the daily total. If you were aiming to add further lighting and perhaps use more equipment at the site, further PV panels would certainly be required from the outset. 3) What type of battery would be required at the site? It is important to have a battery that is ideally suited to deep cycle use. Too small a battery, and it will be overworked and will almost certainly fail and let you down, perhaps even in the first year (even if it is new and of good quality). It is worth mentioning here that ‘car’ batteries are not ideal for deep cycle or ‘off grid’ applications where it will be repeatedly discharged and re-charged. Car batteries are built to provide bursts of high energy to turn over a car engine and are instantly replenished by the vehicles alternator. However, car batteries can be considered a useful source of power if one can acquire nearly new ones from a ‘breakers’ yard. One can always swap in the ailing older battery for a newer one every so often. However, this may become rather tiring once you see just how quickly a typical car battery can start to fail given this type of gruelling and demanding usage. 4) What size of battery is required? Here we look at how the battery size can be calculated to suit the project. We would say it is prudent to think in terms of having at least ONE full week of ‘stored’ battery power available to cover your power requirements during periods of extended dull, sunless weather. That is to say; if it was an extended, dull and overcast winter spell of 7 days (for example), our battery would still be able to provide our ‘200 watt hours’ daily use. During this sun-less period, we would still take our 200 watt hours a day for 7 days from the battery so the total used would be 1,400 watts (7 X 200). Take the figure of 1400 and divide it by the nominal 12v operating voltage and we can see that we have taken over 116 amps (1400 divide by 12). If our ‘deep cycle’ battery was rated at 150 amps it would be close to being fully discharged now. If this sort of discharge (or greater) was allowed to occur multiple times during winter, the batteries life expectancy would be reduced, especially if it was a humble car or truck battery. We do not recommend allowing your battery to be depleted by more than 50% even if it is a true deep cycle product. We also need to include a factor of 20% for losses and inefficiencies in the system generally*. With this in mind, this project would ideally require battery capacity of 300 amp hours or greater. It is important to purchase a battery based on its ‘Ah’ (amp hour) capacity (typically 20 hour rate) and not cranking power. So, for the scenario we have looked at here, we recommend employing TWO 12v 150 amp hour deep cycle batteries. This will cover the system for most of the winter’s typical sunless spells and enable one to run circuits as virtually normal for in excess of 7 days as discussed above. Of course, even apparently sunless days still produce some energy so whereas a powerful sunny period would allow the PV panels to produce say 300 watts on a clear and bright winter day, a dull overcast day may still yield perhaps 25 – 50 watts, so not a complete loss. Even with this sort of power reserve available it is likely there will be some occasions where those sunless days just drag on and on and we may have to make other arrangements to ‘top up’ our battery. We may need to take the batteries home for a good mains powered charge up. With this in mind, a good quality charger with an output of say 10 amps should be available at home when needed. *Batteries are not 100 per cent efficient at receiving power form a PV cell / regulator combo and converting it into stored energy. Typically, the efficiency would look something like 100 watts hours in and perhaps 85-90 watt hours actually stored. This is because the battery works around a chemical process. The process becomes less efficient the older the battery becomes. A good quality genuine deep cycle battery will possibly last 5 to 10 years if not discharged below 50% capacity too often. Life expectancy is improved if not discharged below 75% of capacity. We normally work around taking less than 10% capacity and our main set here is now 15 years old and still going strong. It is important to maintain lead acid batteries so they are kept full to the correct electrolyte levels, are dry and tops clean. Pay special attention to all terminals, connecting links and battery leads to ensure they are not quietly corroding away. If you find a suspect terminal, remove the blue / green fluffy deposits by disassembling the joint, cleaning and sanding (if necessary) and reassembling. Finally, coat the assembled terminal and mounting stud with Vaseline to seal against damp and further corrosion. See image. 5) Closing notes: We recommend purchasing a good quality charge controller to connect your PV panels to the battery set. A full fuction device will allow you to monitor battery volts and allow you to see when power is being generated and going to your battery set. We would recommend minimum ‘10mm’ cabling from PV panels to controller and from controller to battery in the above case. Despite good charging rates and maybe even ‘extra home charging’ if your battery is consistently indicating as being below 12.4 volts (about half charged), do remember that these low readings can also indicate a worn out or tired battery that is no longer up to the duty required – it is not necessarily due to your lighting demands being too high. Of course, we would take it for granted that one should be careful not to leave lighting on unnecessarily or overuse lamps if generally not required. If your project is similar to the project we have discussed above, we know we are working with a 300w PV set (at least to start with) and may opt for a 30 amp regulator as it allows for a small amount of leeway or around 5 amps. 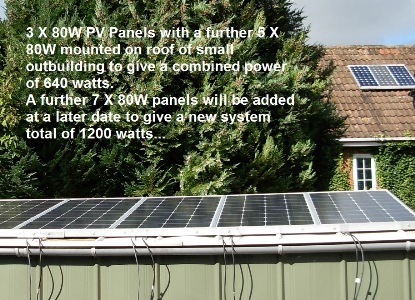 However, we can always add further PV panels of the same wattage, so maybe a further 100w panel the following year after we have had time to see how the system runs. We may find that our particular area would require that we add two more panels to get everything running smoothly. We may also decide to invest in a bigger or more modern battery set in year two or three. 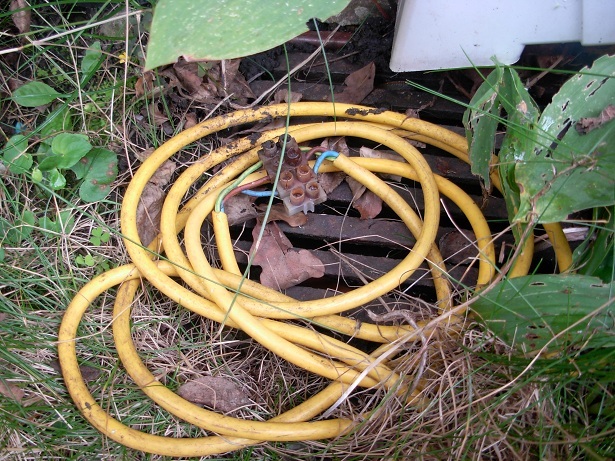 In remote areas it is always worth remembering to install cabling so that it is not an easy target for rodents. Batteries should be contained safely away to prevent access by animals and children and lamps mounted at a height where they will not be damaged by movement of tall objects. If we intend adding further panels almost without doubt, it will be worth investing in a higher power regulator unit of say 50 amps at the start and preferably one of the new breed MPPT units. These can run at a higher voltage by employing a different PV configuration. In this case our panels would be combined to give say 36v nominal (3 X 12v in series not parallel). This would allow the charge regulator to provide power to the battery for an extended period of time improving efficiency sometime by a very larger percentage into the bargain. Regular charge controllers however are not configured in that way and must be wired in the standard 12 or 24v configuration as indicate din the user manual. You may wish to consider using a dedicated fuse box to allow for the connection of the various lighting circuits. These can be separately fused for each individual circuit, and be 2, 4, 6, 8 or more ‘fused’ circuits. Typically these will be rated 5 amps for lighting. Older style fuse boxes that use fuses or fuse wire as opposed to circuit breakers are a good economical choice. The fuse box should be sited so as to be away from potential damp conditions (unless IP65 rated). The battery should also be fitted with a main power fuse to protect the entire system in the event of a catastrophic failure of wiring. In an off grid scenario like the one we discussed above, this could be rated 30 amps. At 12 volts nominal this will allow the flow of power to around 360 watts before rupturing or ‘blowing’. If the flow of energy is known to exceed this, one will need to calculate accordingly. Be sure to use suitable cables for battery to fuse board wiring – as indicated earlier, we would recommend 10mm as a basic standard. Proper connector blocks and good quality cable should be used throughout the off grid system, do not skimp by using tatty or low power ‘bell wire’ cabling as this will be dangerous and will not be efficient for keeping your precious battery voltage high and your lamps bright. Here we have a roll of excess cable with a block terminal connector going rusty, left exposed to the elements. This has been used for 12v exterior lighting. Good practice would have been to have shortened the cable to the correct length and fitted box with a suitable IP rating and able glands to the wall and away from the drain! Nice wiring examples: Using good quality IP 56 boxes with appropriate glands and connector blocks within. 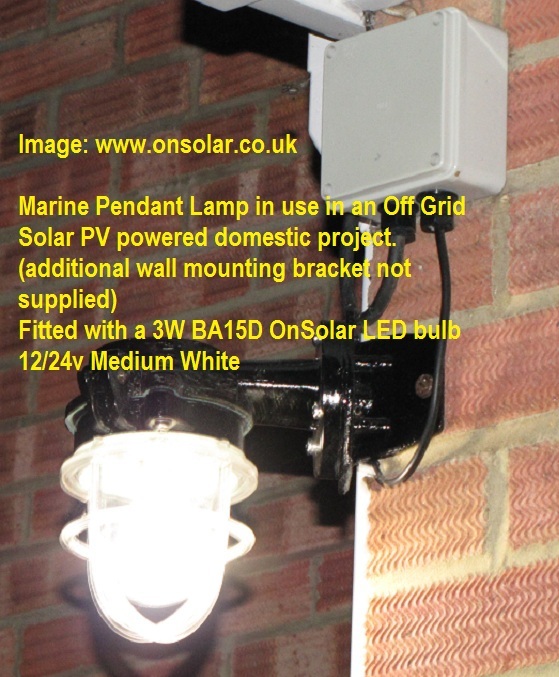 Regular domestic fittings (see below) can often accept low voltage, low energy DC OnSolar lamps without any modifications. (It may however require an AC dimmer unit to be removed). How bright is a lamp? A note about lamp power: Just because a light fixture or bulb has a higher wattage does not automatically mean that it is brighter or has a higher lumen output. Wattage is a unit of power, i.e., the amount of power required for the light fixture to provide its specified number of lumens. Lumens, meanwhile, remain a static quantity. You can think of it like this; A cars engine is the ‘WATTS’ whilst the speed the car can achieve is the Lumens. As you know, poorly efficient, petrol guzzling car engine can be way slower than some of the more modern, highly efficient, smaller engined cars – not too dissimilar to incandescent lighting verses compact fluorescent verses (new breed) LED lighting. One footcandle equals one lumen per square foot (1 fc = 1 lm/ft2) approximately equal to 10.764 lux.